A great wine tote at an affordable price! 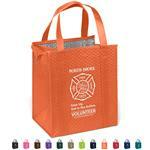 Carry 6 bottle in this 80 gsm polypro tote bag. Velcro closure handles make carrying easier. Foam bottom and built-in dividers offer added protection. Look, feel, strength and quality of cloth. Stitched seams in the side and bottom gussets. FREE SETUP ON FIRST COLOR! Available Colors: Red, Black, Royal Blue, Navy Blue, Hunter Green, Burgundy and Tan. 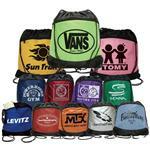 Available Imprint Options: Ask representative for pricing on multicolored imprints.